Subject to the full terms & conditions of the luxuryhotelbreaks.com website. Vouchers can be redeemed against any promotion on the website unless otherwise stated. All promotions are subject to availability and confirmation with luxuryhotelbreaks.com. These vouchers have no direct value with hotels and must be redeemed online through OPL only. No cash alternative or refund. 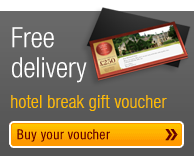 Vouchers must be redeemed online within 12 months from date of purchase, although the actual stay dates can be beyond. Any unused amounts can be used towards a future booking through OPL, but cannot be used as credit at the hotel during your stay. Please contact OPL at enquiries@luxuryhotelbreaks.com with any queries.